I sometimes fall off the grid of blogging for a few days at a time. Whether for real life business or just because I'm not feeling up to blogging... or maybe I just don't have anything to blog at the moment. I didn't feel like blogging anything, but I also didn't really have anything to blog. I probably would have had something to blog, but I had made a decision to commit a combined series review for the last three Steele Street books I just finished reading. So no book updates or reviews were scheduled for posting. Anyway, I'm still sort of nursing a Book Game Hangover with the ending of Booklikes-opoly. And even while COYER is still in play, I hadn't really felt like writing anything since those last few posts on July 31st. My monthly wrap ups are usually pre-drafted, so they don't really count. So here I am, hijacking a book meme for the purpose of updating anyone who cares about what's been going on... which really has been a whole lot of nothing, but working and reading and sleeping, and generally just lazing around when I'm not working or reading or sleeping. I probably won't continue this meme on a weekly basis, but there's no doubting that it's a nice way to make an update on the blogosphere! The 'It's Monday!' meme might make another appearance if I ever seem to be on a blogging slump. I'm including all the books I had read starting last Monday to this Sunday. Technically, I started reading Cold Memory prior to last week, but I spent a good portion of my time finishing it over that weekend and didn't quite finish until last Monday. And as I'd stated, I just recently finished the last three Steele Street books, an audio book that was quite intriguing (Amanda Quick, after all), and a short story I squeezed in last minute on the 31st. Cold Memory and Dream a Little Dream (in the A Christmas to Remember anthology) are the only two books I've posted a review for so far. I've had Once in a Lifetime sitting on my Kindle as a borrowed library e-book for about a week now, and it's probably past time to get it read. I'd been holding off on it for a while because my main goal was to get the last three Steele Street books finished first. If I manage to do so, I will be starting the next Mordecai Young book, pending my completion of Thicker Than Water. Since my average is usually about three books a week, I don't expect that I'll be able to start the third (and last) Mordecai Young book this week, but if I do, it'll be a bonus. I haven't done a whole lot of planning for my blog in a long time--Booklikes-opoly was a very "blog as you go" type of reading game, and pretty much all my book selections were unplanned and a lot of blog updates and book reviews weren't exactly scheduled. Nonetheless, I'm going to try to give my blog more of a structure once again, although the only real post I have planned is my review for the Steele Street series. And then, depending on when I finish Thicker Than Water, or Once in a Lifetime, I may have a review out for one or both books this week... maybe not. Once again, the truth is, I'm really using this weekly bookish meme as a reason to post an update. If I had thought of it ahead of time, I would have done a Sunday Post yesterday. But I didn't, so we get this "It's Monday!" post instead. Which really works the same way, right? I am an Amanda Quick fan and looking forward to her next. I spent a good part of last week re-reading some of my old favorites. Come see my week here. Happy reading! I've also got Amanda Quick's newest release on hold via library and waiting for availability! Happy reading to you as well, and thanks for stopping by! Blogging should be fun. If it's work and you're not being paid for it, taking a break makes sense. Come see what I'm reading. I do love to blog when I'm in the mood for it, but I think sometimes I go a little overboard and stress myself out, trying to get books reviewed and posted in a timely manner, or trying to post updates so it feels like I have SOMETHING to post. But I agree, sometimes you still need a break from things you love, whether blogging or reading or whatever. Thanks for stopping by! And happy reading! I've read Wicked Intentions and I loved that book! I hope you enjoy it when you get the chance to read it! 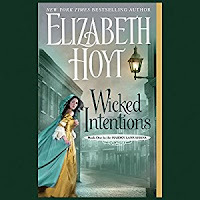 Oh, I'm currently listening to the audio of Wicked Intentions, narrated by Ashford McNab, and it is definitely drawing me in. This one feels a little darker than some of the other historical romances I've been reading. I'm already making plans to continue the rest of the series.